Most of us have seen that boat at the marina or on a trailer in someone’s yard that, although it’s only a few years old, has faded upholstery, dry and cracking wood brightwork, mildewed gelcoat and smells like a musty locker room. What’s the easiest way to avoid that? 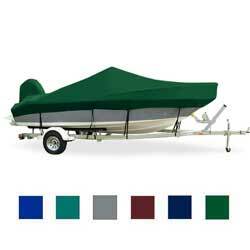 A boat cover. It’s also a good way to make it difficult for rodents to take up residence and protect your electronics from dust, dirt, bird droppings or sticky-fingered intruders. 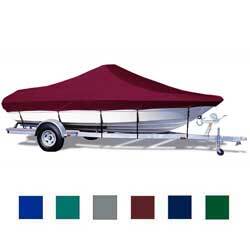 We’ll cover (pun intended) the basics of choosing boat covers below, but for a more thorough explanation and installation videos covering each type, see our West Advisor article: Selecting the Right Boat Cover. 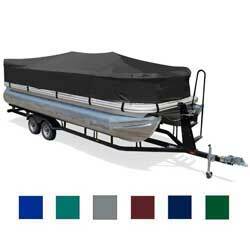 Do you want a cover for storage or trailering? 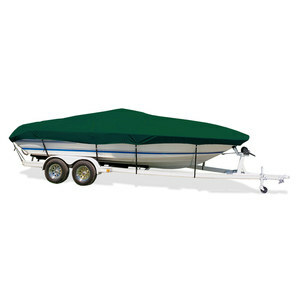 Storage: Covers that are intended for storing your boat on a trailer, at the dock or while moored, fit loosely and can even be as simple as a blue tarp. 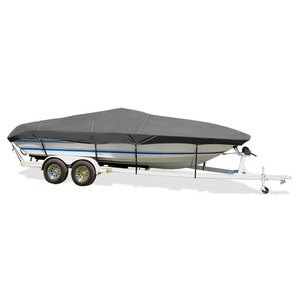 Trailering: The forces encountered pulling your boat on a trailer at high speeds requires a better fitting, tighter, reinforced cover that is made for your type of boat. What type of cover should you choose? 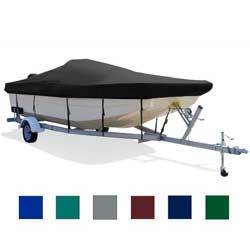 Universal Fit: Perfectly fine for storage or a short trailer trip, universal fit covers offer an inexpensive way to protect your boat. 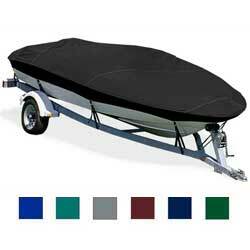 Like the name implies, these covers are designed to fit a wide array of boats with assorted accessories. Sizes are grouped in boat lengths in ranges of two or three feet. These covers are not intended for longer trips at highway speeds. You’ll find these covers are available in only one color, usually gray. 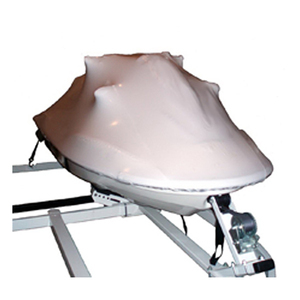 We stock universal fit covers in different weight fabrics and sizes for V-hull cuddy cabin, bow rider and center console boats, bay boats, day cruiser boats, deck boats, jet boats, tri-hull boats, pontoon boats, fish and ski boats, aluminum and tournament bass boats, paddle boats and even inflatable boats or tenders. Each cover includes a storage bag and tiedown straps (some with a support pole). Semi-Custom: Next in price and complexity are semi-custom covers with tighter, better fitting, yet still liberal sizes designed for different makes and models of boats with a similar hull style. An example would be covers made for Whaler style inshore fishing boats. 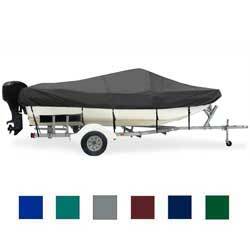 These covers fit smaller, center console boats with console heights up to 48”, bow rails 6”-18” and side rails up to 10”, plus bound-in outboard motor hoods are included. Custom: Hands down, the best fitting covers are custom made. 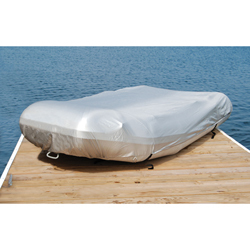 Although more expensive than universal or semi-custom covers, these covers are made to fit just one boat—yours. 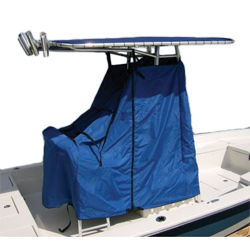 Each cover is designed for a particular year, make and model of boat with individualized accessories like transom-mounted swim platforms taken into account as well. 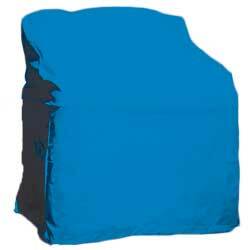 Since they are sturdier and tighter fitting, these covers are the best type for trailering and the longest lasting. What are your fabric choices? In order to protect your boat and last the longest, you’ll need to select fabric for the specific use you have in mind. You need to consider where you’ll be storing your boat. If you’re going to be trailering your boat—how far? 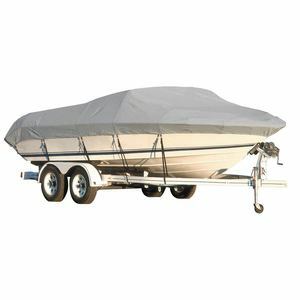 Just like good foul weather gear, the fabric your boat cover is made from needs to keep water out, but allow water vapor on the inside to escape. This will help prevent mold and mildew. If you live in the southern United States or a place where your boat will be regularly kept in harsh sunlight, you need fabric that’s highly resistant to UV light. If you’re going to be trailering your boat at highway speeds for long distances, tensile strength and abrasion resistance are important to withstand the unique strains the road will have upon the fabric. Cotton and polyester blends aren’t as durable or resistant to mildew and UV light as pure synthetic fabrics. Those fabrics that repel water and resist UV radiation the best typically contain pigment-dyed polyester which has a good strength to weight ratio and is strong and breathable. 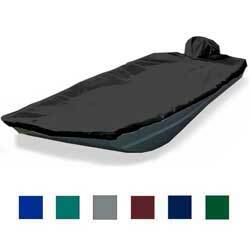 Hot Shot™, an acrylic-coated polyester, is a good, economical synthetic fabric. The solution-dyed polyester Ultima™ fabric is durable, breathable, repels water and is stain-, UV- and mildew-resistant, making it a good choice for hot, humid climates. We offer Taylor Made® Trailerite® semi-custom covers in Hot Shot™ fabric and custom covers in both Hot Shot ™ and Ultima™ fabrics. All of which are available in six colors and ship within five working days. Is the color you choose important? You’ll probably be surprised, but darker colors are best. Dark colors require more dye which increases a fabric’s UV resistance and contributes to a longer life. Blue, black and green last longer than white, tan or red. The only downside to darker colors is that they absorb more heat and transmit that to whatever is underneath them. Your choices for universal fit covers are limited, but there are quite a few colors to choose from for semi-custom and custom. 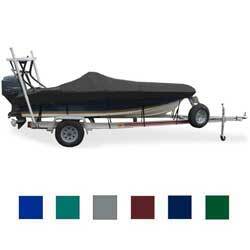 How do you measure your boat for a cover? First, you’ll need to know your hull style. 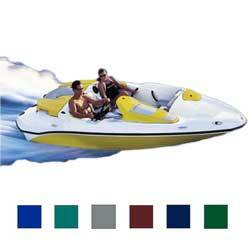 If you’re unsure, look for a boat pictured on westmarine.com that matches yours as closely as possible. Next, use a tape measure and measure the beam width (the widest distance across the boat in a flat line). You’ll do the same thing to measure the centerline length (the overall length of the boat measured in a flat line between the farthest points forward and aft that you want to have covered). Finally, allow for options like bow pulpits and swim platforms; however, don’t measure over them. You should always measure in a flat, straight line. 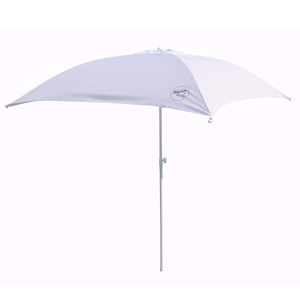 Covers are offered in one-foot length increments, so you’ll need to round off to the next foot if in between. 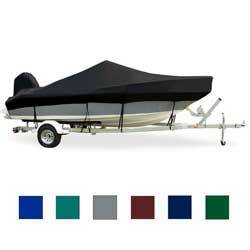 Is there an easy way to order a cover for your boat? You bet there is! 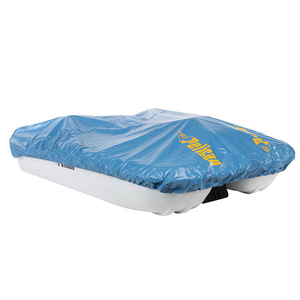 If you have a production boat, using our handy Boat Cover Selector will make finding the correct semi-custom or custom cover for your boat much easier. The selector will lead you through all the steps necessary to select your exact boat and then choose a fabric and color. If you happen to have a one-of-a-kind, custom-built boat or lots of unusual options, you might need to have measurements taken by a custom canvas shop so a cover can be designed for your boat. This will be the most expensive kind of cover and take the longest to receive since a custom pattern will have to be made. One of the most important things you can do for your cover is getting the correct size. If it’s too small, the fabric and seams will be overly stressed and wear out prematurely. If it’s too big, rainwater will collect in the low spots and cause sagging, plus wind will get in, under or around and fill the cover with air, possibly snagging or tearing it on sharp objects. 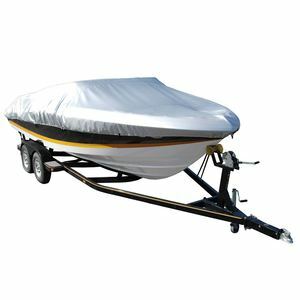 This could also become a safety hazard if your cover is being used while trailering your boat at highway speeds since it will flap wildly, which could reduce your visibility and distract others. 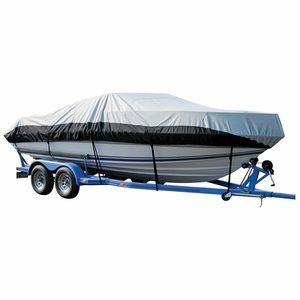 Securely tying down your cover to your boat or trailer using every tiedown loop will help prolong the life of your boat cover. Rope, shock cord or straps may be used. Remember to support and pad your cover at high stress areas and anywhere hooks or buckles might scratch your boat’s finish. Another way to prolong the life of your cover is to wash it with mild soap or detergent regularly. First shake out the dust, then use a garden hose or air compressor to remove any leftover dirt. After washing, hang it on a line to dry. Refrain from using bleach, harsh chemicals, scrub brushes or putting it in a washer or dryer.